Wisdom is a theme throughout the entire Bible, but the reader will especially not escape Wisdom’s call when turning to Proverbs. Just as Proverbs 1:20 depicts Wisdom as “cry[ing] out in the streets”, so too it cries out to us from each chapter. We live in an information age. Simply keeping up with technology and politics can be a challenge, let alone remaining well-versed in all the little extras that are deemed important within society. The pressure is not confined to only adults. Children’s education is pushed earlier and earlier. More and more activities are added to the “well-rounded” requirements list. The question is, do we take the time to hear Wisdom’s cry? It is often thought that wisdom comes with age. In large part, I believe that should be true. If I am no more wise in twenty years than I am now, then I will have to ask myself some serious questions about how I’ve lived! Rightly so, secular definitions of wisdom will indicate a correspondence between life experience and wisdom. The Bible, on the other hand, hones in not only on experiential learning, but even more importantly on character development. In other words, the common theme of a Proverbs-kind-of-wisdom largely comes down to our heart. After all my siftings through Proverbs over the years, I have come to believe that there is one foundational element to wisdom: HUMILITY. This should be of no surprise, since either “pride”, “humble” or “humility” is mentioned at least a dozen times in Proverbs alone. This is only counting overt quotations in which the specific words are mentioned. Added to this list are numerous other references that wisdom and humility go hand-in hand. A humble heart allows the building blocks of wisdom to form. Proverbs covers many different aspects of wisdom. Discipline, for instance, is a common theme. However, I believe this to be a fruit of wisdom and not a building block for wisdom. Just as we hear two issues echoed throughout the Old and New Testament commandments, loving God and loving others, so also I believe two similar themes show up in the building blocks of wisdom. 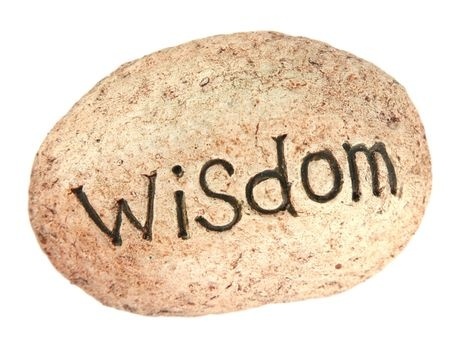 The first building block to wisdom is a healthy fear of the Lord. Secondly, wisdom is built within a respect for others. Where does humility fit into these? Remove humility and neither one of these building blocks are possible. Remove humility and down falls wisdom. After all, pride comes before the fall (Proverbs 16:18). I should note one important disclaimer whenever the phrase “fear of the Lord” is used. This is not to say that we walk through life continually afraid of God’s judgment or displeasure with us, nor that His character is unmerciful. The truth is that God is love (1 John 4:8) and He is rich in mercy (Ephesians 2:4). Equally and simultaneously important, however, is to understand that God is holy (1 Peter 1:16) and His judgments are true (Revelations 19:2). I would assert that without understanding this latter statement, one will never fully understand the former. A humble person with a healthy fear/respect for God will acknowledge that He is God and we are not. Yes, I feel I have to state the obvious! I know for myself that this statement may be easily acknowledged in words, but unfortunately not always in our hearts or our actions. If it is unclear why the fear of God has any association with humility, then simply look to the two great falls within history. Lucifer (now Satan) possessed great wisdom until one sin entered his heart: pride. Ezekiel 28:17, as most theologians agree, sheds light on the arch angel’s fall in his prophesy: “Your heart was lifted up because of your beauty; You corrupted your wisdom by reason of your splendor”. Isaiah 14:14 adds even more explanation to these events when describing that Lucifer’s desire was to make himself “like the Most High”. History then repeats itself within the Garden of Eden where Satan uses the identical weapon of pride against Adam and Eve to destroy any fear of the Lord and respect for His command. Pride grew from the same desire, that when they ate of the forbidden fruit they would “be like God” (Genesis 3:5). Unfortunately, history continues to repeat itself. Pride creates in us the desire to pursue our own way, seemingly oblivious to the fact that God would know better, and resistant to the fact that in the end, He will judge our eternal course. Humility understands His supremacy and respects His spiritual laws. Humility submits to His will. Humility is conducive to walking in His ways. This is wisdom . . . or at least the beginning of it. “Pride only breeds quarrels, but wisdom is found in those who take advice” (Proverbs 13:10). “Listen to my instruction and be wise” (Proverbs 9:33). “Listen to advice and accept instruction, and in the end you will be wise” (Proverbs 19:20). “Plans fail for lack of counsel” (Proverbs 15:22). “The wise in heart accept commands” (Proverbs 10:8). “He who ignores discipline despises himself, but whoever heeds correction gains understanding” (Proverbs 15:32). “He who answers before listening – that is his folly and his shame” (Proverbs 18:13). From experience I can say that it is easy to appear wise in our own eyes. On the contrary, this mentality is often a red flag that we indeed are not! Our perspective is just that – our perspective. It is unnatural to see things from a different point of view, and equally unnatural to view ourselves outside the context of our own desires. On the other hand, humility will always direct our view towards God for His perspective. It will also honor the experiences of others from which we can learn, as well as our relationships with others. At times I am so preoccupied in the attempt to fill my head that I miss the call of God attempting to change my heart. I catch myself yearning to appear knowledgeable before men, rather than acknowledging the higher Wisdom from God. Certainly there are benefits to today’s information age. Nonetheless, it is important to frequently question our own attitudes and motivations. “The wisdom of the prudent is to give thought to their ways . . a prudent man gives thought to his steps” (Proverbs 14:8,15). When choosing our steps, the ultimate choice is to walk humbly with our God. We can choose to humble ourselves, and I can testify (unfortunately) that it’s a far better option than being humbled! Categories: Lesley's Blog | Tags: Humility, Proverbs, Wisdom | Permalink.